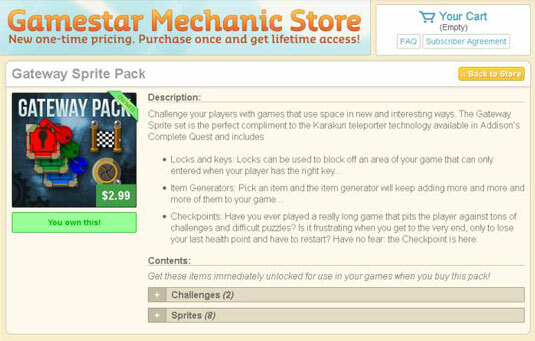 Click the Store button at the top of any Gamestar Mechanic page, or go directly to the Gamestar Mechanic Store. If you want to see specific information about the pack, click the image corresponding to the pack you want to buy. This button is below or on the image for the sprite pack (depending on whether you followed Step 2). If you don’t see the Add to Cart button, you may already have this feature. Follow the instructions to pay for your purchase. If you aren’t yet 18 years old, a parent or guardian must complete the credit card purchase. After you purchase a product from the store, the new quests and challenges become available in their respective places: Quests are available on the Quest page, and challenges are available in the Workshop. You have no hardware to install or files to download, so you can access these features right away.